You are currently browsing the archives for the tag 'HUB1710 self-winding mechanical movement'. Aren’t these watches just so beautiful?! 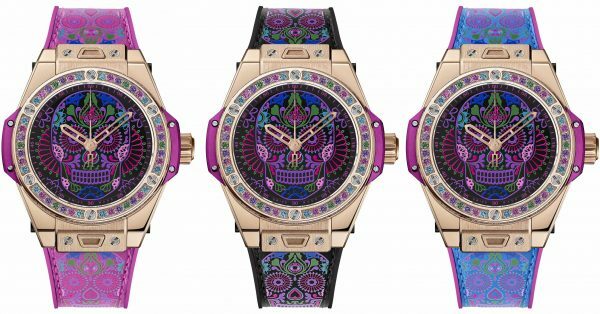 In an ode to life, HUBLOT once again displays its positive attitude by celebrating one of the world’s most popular holidays: El Día de los Muertos. 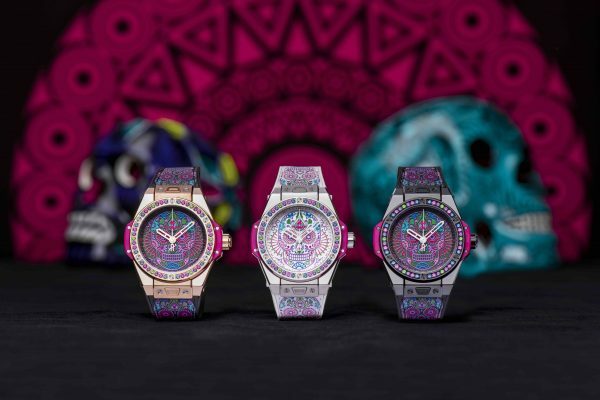 Hublot imparts its interpretation on this life affirming celebration with the HUBLOT Big Bang One Click Calavera Catrina, the most carefree piece from the skull series. Your attitude determines your altitude and at HUBLOT life is always viewed in the most beautiful and joyful way. 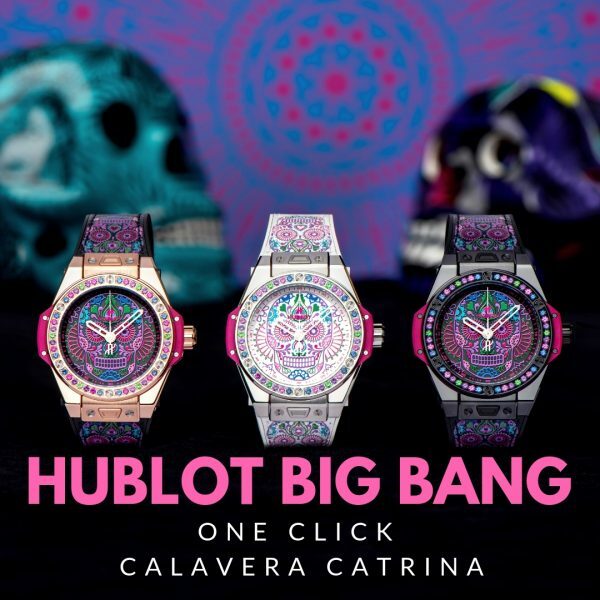 The Big Bang One Click Calavera Catrina, launching at the 11th annual SIAR ( Salón Internacional Alta Relojería) watch fair in Mexico is a tribute to life. The Big Bang is ready for the big celebration transforming its iconic design into a party-ready, carefree, elegant and eccentric timepiece available in eye-catching fuchsia, purple, green, turquoise and blue. 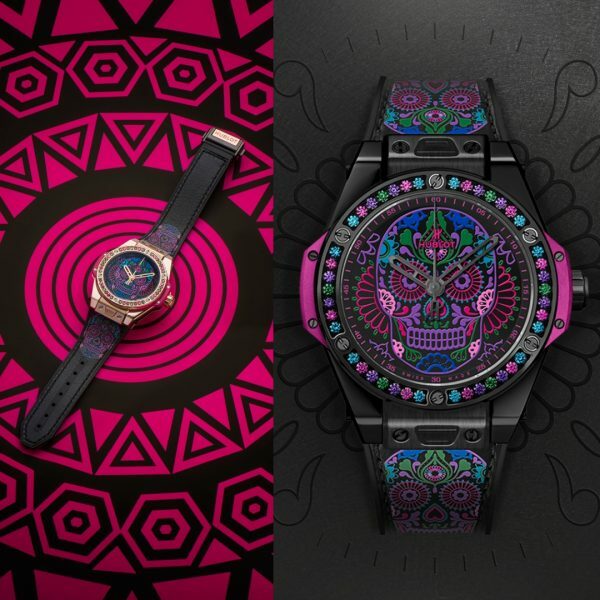 Bringing to life the traditional face-paint of the «calaveras» and the sophisticated make up worn by the «Catrinas» (Elegant Skull) during the celebrations the timepieces showcased a lacquered dial in black or white, engraved with coloured lacquer. The colourful and elegant dresses are conveyed through the straps with stitched multi-coloured skulls and the bezel covered in a 42 sapphire rainbow. There are three limited editions in total: a steel version featuring a white lacquered dial with a matching white leather and rubber strap (100x pieces – CHF 15.400), a ceramic version (100x pieces – CHF 16.400) and a King Gold version (50x pieces – CHF 27.400) both with matching black lacquer dials and black leather straps. 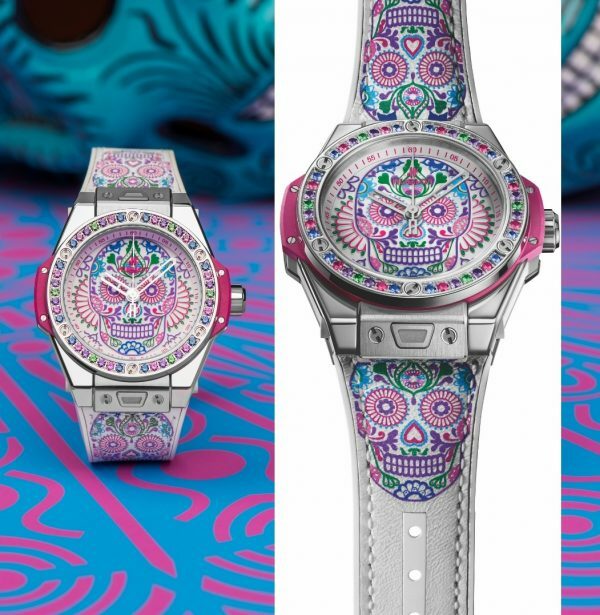 The One Click interchangeable strap system allows the Big Bang One Click Calavera Catrina to be transformed instantly and worn with blue or pink leather straps. The timepiece features the HUB1710 self-winding mechanical movement with a 50-hour power reserve. 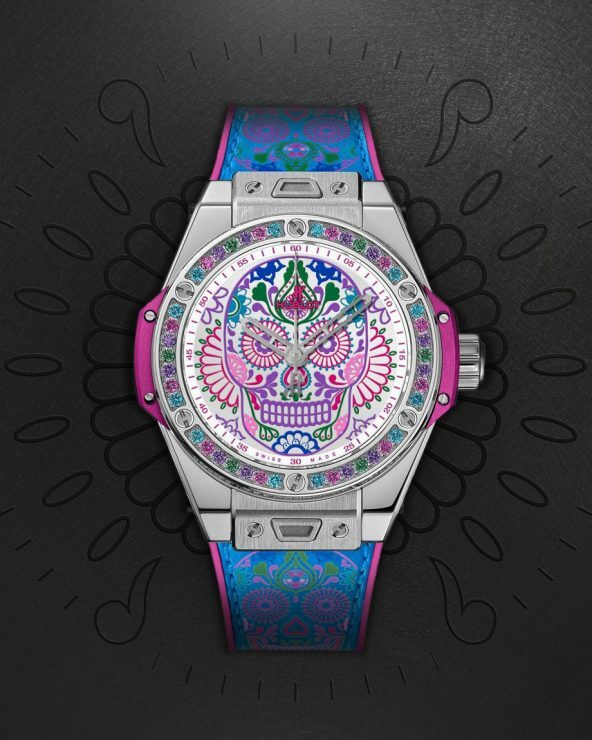 Whether to pay tribute to El Día de los Muertos – an Aztec tradition dating back more than three centuries, and a celebration which has been recognised as part of world cultural heritage (UNESCO) since 2008 – or as a daily reminder to live fully, the Big Bang One Click Calavera Catrina tattoos the pulse of life to your wrist. A watch full of life and joy, it aims to transform every moment into a happy one. Life in HUBLOT colors, I am on!